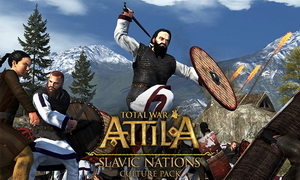 The Slavic Nations Culture Pack brings three new playable factions to Total War: ATTILA. The true origins of the Venedians are shrouded in confusion, the Romans incorrectly classifying them as a Germanic people. With typical Roman snobbish arrogance, Ptolemy described their squalid living conditions and their «repulsive» appearance. Despite these scathing remarks, the Venedians have endured, becoming so populous that they have branched into two separate groups; Eastern Roman scholars make specific mention of the Venedians as the «fathers» of many of the other Slavic peoples. Although considered a guiding light in the gloom of the upcoming 5th century AD, the path ahead will not be easy — Huns, Romans and barbarians all encroach on Venedian territory. Yet if they can hold their nerve, and never cower to the mighty or the desperate, they may rise to inherit the world beyond! The Sclavenians are an aggressive Slavic people who descended from the east, taking advantage of the thinly-spread Imperial armies and raiding Thrace and Illyricum — intent on finding both loot and a place to settle. Inevitably, this has drawn the ire of the beleaguered, but nevertheless still proud and mighty Roman Empire. Now, as the 4th century AD ebbs away, the 5th promises to be a time of unending challenges. Yet the Sclavenians are possessed of a fierce and irresistible temperament, showing time and time again that they are capable of mighty feats and that the future will be no different!